While I need to finish building a suitable space for for dry-curing, I can still get my fix of savory, semi-cured meat. 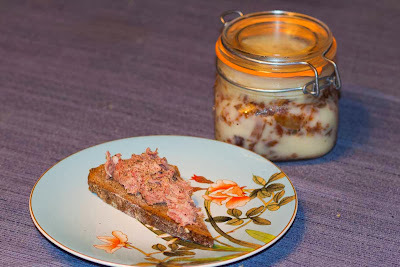 Rillettes are one of my favorites, as they're just so easy and delicious. Unlike the more fussy aspects of pate making, rillettes are nothing more than cheap, tough meat cooked in fat until tender, and then packed in jars and sealed with fat. The slow cooking eliminates the water in the meat, which helps to preserve the meat from spoiling (plus a generous amount of salt). 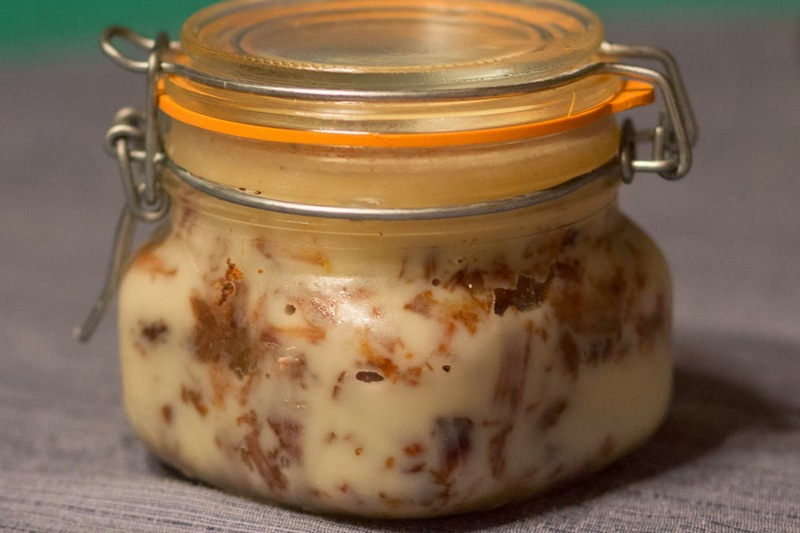 Sealing the jars with more fat creates another barrier, and allows rillettes to last for several weeks to a few months. It's a lot like making duck leg confit, but with pork. Then, rather than storing the legs whole in a crock of fat, the meat is shredded and mixed with warm fat to create a loose, spreadable paste. It's this paste that's packed into jars and then sealed with hot fat. Rillettes can be spiced a number of ways, from just salt and pepper, to more elaborate preparations of French quatre-epices spices or black truffles. 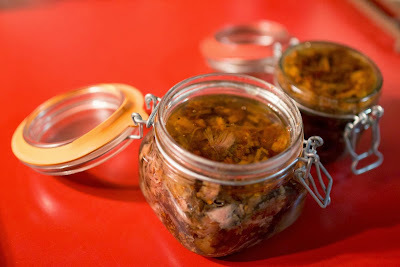 I enjoyed a fennel-spiced duck confit a few years ago, and took that route with these rillettes, seasoning them with fennel and white pepper. They came out really well, although I think the fennel flavoring could be a bit stronger. I love them served on dark rye bread, but you could also mold them into some fancy shapes if you desired to up the presentation factor. Sharp, garlicky pickles are great too, plus they cut the richness of the fat. For storage, little ceramic crocks are traditional, but I like using these bail-top glass jars. Despite pressing down the fat and tamping the crock on the kitchen counter, I still had a few air pockets in this jar. Not a big deal; it just means this one gets eaten first. But using clear glass jars is a good way to check your work, once the hot fat has cooled and solidified, if you are looking to make a product safe for long-term storage.